Happy 2015, listeners! Granted, new year feels like a long time ago, but it’s been a while since we talked. Please click here for your first playlist of 2015, lovingly compiled by yours truly. You can also view the track-list here. LoneLady’s single ‘Groove It Out’ was released to limited, but enthusiastic acclaim in November last year. Her first album Nerve Up was released in 2010 to widespread praise and she’s just announced the release of her second album, Hinterland, which is due for release on 23 March. LoneLady, AKA Julie Campbell, is also playing a series of live dates. Find out more here. Quadron’s ‘LFT’ struck me as a summer track, but I’m not prepared to sit on it until July and think we could all do with a sunshine injection in this, the bleakest month. The track screams of Quincy Jones/late 1980s Michael Jackson, something Quadron acknowledge in this article. I’ve just discovered Caviare Days ‘Fresh Tomatoes’, which I hope you enjoy as much as I do. With its heavy 1960s influence, it brings to mind Jefferson Airplane. I’m looking forward to listening to more from these Swedish artists. Finally, I’d like to say a big thank you to David Wilkinson for introducing me to Pauline Murray and the Invisible Girls, through his fantastic article recently published on the site, which you can read here. 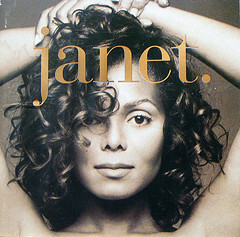 The image is the classic album cover from Janet Jackson’s seminal 1993 album Janet. The cover is a head shot of Janet, with her hands clasped together above her head. The image has a sepia tint and was taken by the photographer Patrick Demarchelier.